I've made chocolate chip cookies countless times and am always interested in new versions of this classic. I haven't really had a go-to recipe until I came across this one from Bite Me by sisters Julie Albert and Lisa Gnat. For starters, these cookies are larger than most cookies and do not flatten out to become thin discs. They are solid, dunkable and chewy - just how I like my cookies. I've made them a lot and they've never disappointed. Impress your family and friends and whip up a batch today! Preheat oven to 325 F. Line 2 baking sheets with parchment paper. In an electric mixer, cream together butter, brown sugar and sugar on medium speed until well blended. Beat in vanilla, egg and egg yolk until light and fluffy. On low speed, add flour mixture and chocolate chips, mixing just until flour disappears. Drop dough by 1/4 cup at a time, 2 inches apart on the prepared baking sheets. Bake for 15 minutes or until the edges are golden brown. Remove from oven and allow to cool a few minutes before transferring cookies to a wire rack. I've been a fan of the Podleski sisters ever since they released Looneyspoons in 1996. I have all four of their cookbooks and their latest, The Looneyspoons Collection, was given to me a few weeks ago as a gift. It contains their greatest recipe hits updated and some brand new ones. It's a beautiful book to go through and I do think there is something for everyone in it. Preheeat oven to 350F. Spray a cookie sheet with cooking spray and set aside. Combine flour, oat bran, baking powder and salt in a medium bowl. Set aside. In a large bowl, beat together both sugars and butter on medium speed of electric mixer for 1 minute. Add eggs, egg white, lemon zest, lemon juice and vanilla. Beat again until well blended. Using a wooden spoon, add flour mixture to sugar mixture and stir just until blended. Dough will be thick. 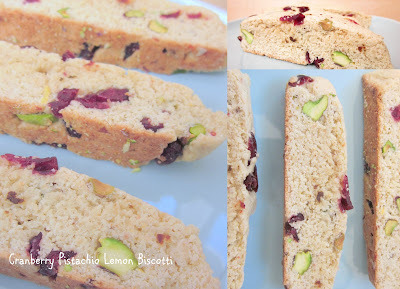 Add cranberries and pistachios and mix well. Divide dough in half. Using lightly floured or greased hands, shape each half into an 8 x 3 x 1/4-inch loaf and place on prepared cookie sheet, about 3 inches apart. Add a bit more flour if dough is too sticky. Bake on middle oven rack for 20 minutes. Remove loaves from cookie sheet and cool on wire rack for 15 minutes. Reduce oven temperature to 275F. Transfer loaves to a cutting board. Using a very sharp knife cut each loaf crosswise on a diagonal into 9 slices. (You'll have some scraps from the end pieces, so go ahead and eat them. Everyone knows scraps have zero calories.) Place slices, cut-side down, on same cookie sheet. Return to oven and bake for 8 minutes. Turn biscotti over and bake for 8 more minutes. Cool completely on wire rack. Biscotti will harden as they cool. Note: If you prefer super-hard biscotti, increase baking time from 8 minutes to 10 minutes per side. I made cupcakes yesterday after a very long time. They were for a birthday and I decided to jazz them up by using origami paper for the liners which worked perfectly. The little bit of extra flair upped the oomph factor and made for a seriously pretty platter. The cupcakes were moist and tasty on their own and the buttercream was deliciously creamy. The recipes are easy to follow and make. The cupcake recipe is actually for chocolate cake but I made 21 cupcakes with the batter and baked them for 20-22 minutes. Preheat oven to 350 F. Prepare two greased and parchment-lined 9-inch round cake pans or one 9 x 13-inch rectangular pan. Set aside. In a large mixing bowl, combine the flour, sugar, cocoa powder, baking powder and baking soda. Add the milk, vegetable oil and vanilla and beat with an electric mixer for about 2 minutes until smooth, scraping down the sides several times. Add the eggs and beat for another 2 minutes. Pour batter into prepared pans, them slam the pans on the counter once or twice to eliminate bubbles. Bake for 35 to 45 minutes or until a toothpick inserted into the middle of the cake comes out clean. Let cool in pan for 5 minutes, then invert onto a rack, peel off the paper, and let cool completely before doing something delicious with it. Makes two 9-inch round layers or one 9 x 13-inch rectangular cake. Makes more than enough ultra-creamy frosting to generously fill and frost a two-layer, 8 or 9-inch round cake. Or more than enough to thickly frost the top of a 9 x 13-inch cake. I have made many a dinner from it (the Fiesta Bowl Salad is always a hit) so I made this bread one lazy Sunday. All I can say is that you won't be disappointed with the result. This lovely loaf was a snap to throw together and quite satisfying. If you're looking to check out a new book, Bite Me is worth a peek.